I'm a huge Kjaer Weis fan so I can't explain why it took me so long to start exploring the cream blushes from this line. 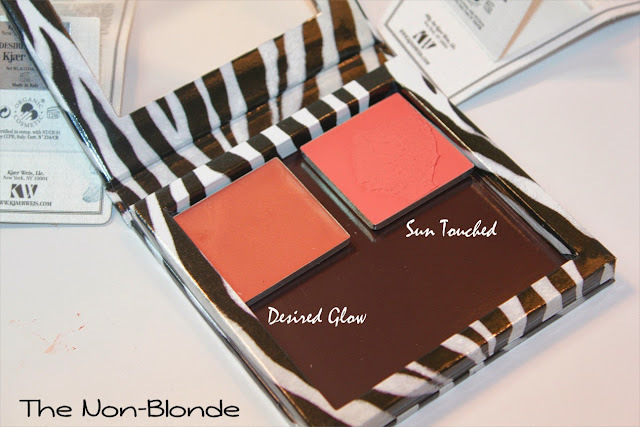 The blush comes in six colors and it was quite hard to choose because these are incredibly flattering and natural looking shades of rose and peach, all designed to enhance your skin tone and go with it. The cream texture is very light as you blend it (fingers are fine. I also use the smallest Yachiyo brush from Hakuhodo). 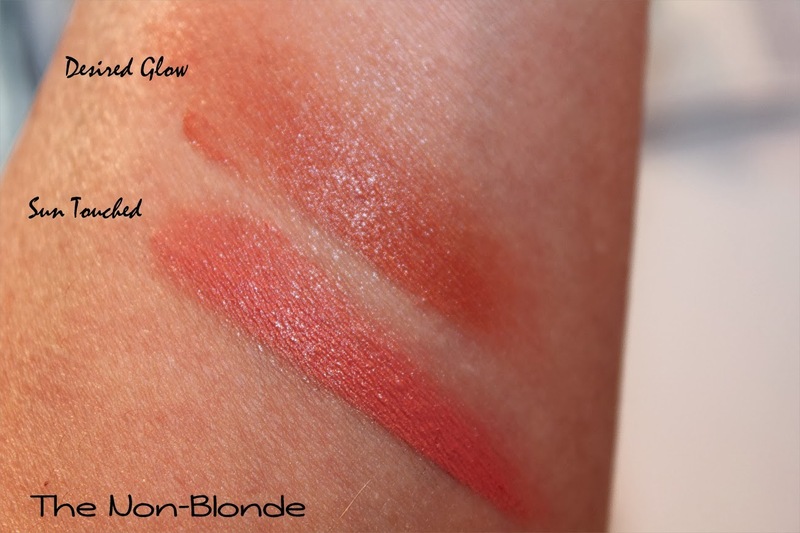 I find the texture of Kjaer Weis blushes a little lighter and more sheer than the Hourglass duos (see here and here), but there's still a lot of pigment there to give a good glowing flush. I chose Sun Touched and Desired Glow as my first Kjaer Weis blushes, probably because I was craving the warmth ('tis the season). Sun Touched (the cover got stuck to the pan when I opened it) is the coral one, while Desired Glow is a golden tan. My favorite way to wear them at the moment is to mix them together for a perfect peachy hue. I've also experimented successfully with using Desired Glow as a very subtle bronzer/complexion enhancer, then adding Sun Touched as a bright blush on the apples of the cheek and blending it into a seamless healthy look. You can always finish with a powder blush on top, but I don't see a reason. Kjaer Weis blushes last on my skin for about 12 hours and I love the sheer finish and non-makeupy look they give. Bottom Line: I'll have to get a few more. Kjaer Weis Cream Blush Sun Touched & Desired Glow are available from kjaerweis.com. They come in a gorgeous sleek compact (refillable) for $56 or as a refill ($26) which is what you see above. I adore their products. Always the highest quality, and flattering on the skin. Worth every penny! These look so beautiful! 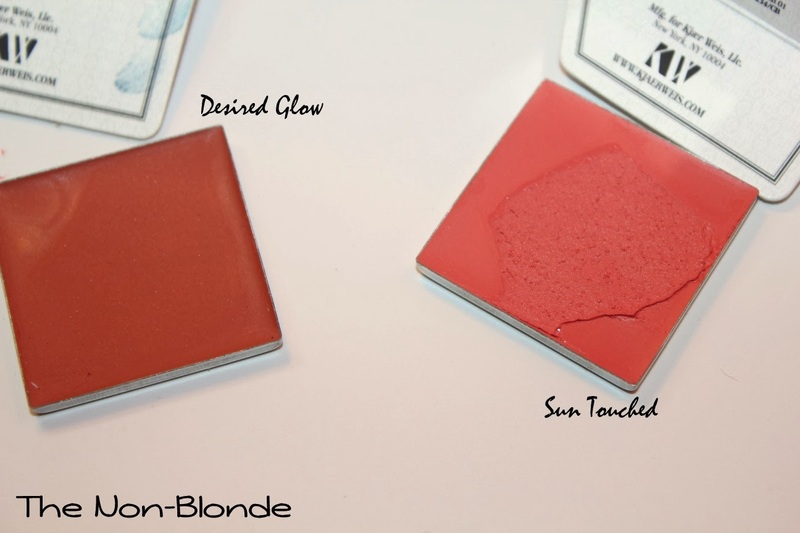 How do they compare to the chanel cream blushes? IMO, the colors are much better as is the texture. I did not like any of the Chanel shades, and found the texture a bit slimy. I passed on them and will buy another K-W.